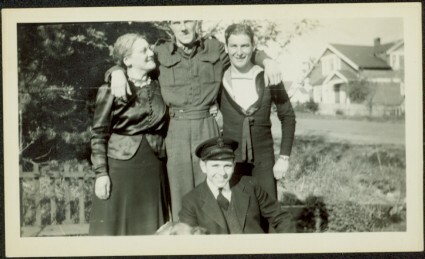 Sarah Glassey stands to left of three unknown men, embracing the man beside her who wears what is believed to be a pilot's uniform. Young man seated on ground wears suit, tie, and military hat. Young man on far right wears navy uniform. Trees in left background, street and houses in right background. Item is part of the Taylor-Baxter Family Photograph Collection. See also items 2009.5.2.296 - 2009.5.2.300 for images featuring similar content. Stamped annotation on recto of photograph: "73", handwritten: "4".